Are you looking for a light weight badminton shoes with good cushioning? We have the best options for you, available in India. Badminton is a sports that demands speed and agility. And footwear will surely play a major role in your efficiency and quickness. Following are few recommendations on good badminton shoes for beginners and advanced level players. Asics – Asics use Gel Blade and Gel Progressive technologies for agility and stability. Yonex – Power cushioning is the major technology used in yonex badminton shoes. Yonex claims that power cushioning will absorb and reserves shock power for next movement. Nivia – Nivia verdict, Hy-court, achiever, Appeal, Smash etc are top selling Nivia badminton series’s. Adidas – Adidas Instinkt and precision are two main categories of Adidas badminton shoes. Li-ning – Li ning ‘competition’ & ‘professional’ are 2 main series of badminton shoes from Li-ning. Victor – shoes are categorised into three, ‘all round’, ‘support’ and ‘speed’. What is special about badminton shoes. why not normal shoes ? So lets have a look at things that makes badminton shoes different from other types of shoes. Success in badminton depends on a quick and efficient footwork. Badminton involves quick movements like jumps, quick forward and backward movements from ready position. Normal shoes are not optimised to absorb shocks, they slip in PU court, are not light weight & don’t have enough cushioning. This means high chance of ankle injuries and blisters. Many players spend more time to choose a racket, that is best for their playing style. But foot wear also are at least as important as rackets. Footwork is one of the most important skills developed by young professionals in an early stage of career. For moving fast shoes need good traction and grip. Lightweight designs in best shoes help in efficient movement. Good sole types absorbs and reserve shock power. Grips made with different rubber types help with reverse movement, Sudden turns, sudden halt quick jumps etc. Stability is achieved by using different sole shapes. ‘PU-synthetic’ or ‘cement’ are the most common indoor court types in India. Choose a sole type depending on the surface you are playing on. Main sole types are- soles made with different materials like gum rubber, non marking rubber sole etc. Top brands also use their own technologies to improve sole performance. Tops brands innovate and nurture new technologies for better experience. 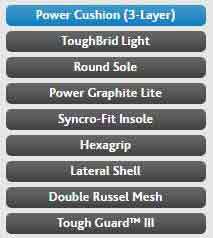 For example yonex developed power cushioning for efficient shock management. They also developed many other technologies as shown i n the image. Many options are available other than Yonex, which is offering good quality at lower price. Ergo-shape & round sole provide comfort and stability at the forefoot area and toes. Double Russel Mesh controls moisture and help in better air exchange. Hexagrip, Lateral shell, Syncro-fit sole etc are other innovations. Made with PU, linen and non marking sole, this shoe have colourful design combination of white, red and black.These shoes are also quite popular among the Badminton players. They are also available within INR 1000. They are made up of good quality material. Players can find it very comfortable to play in those pairs. If you have little bit more budget then you can go for Nivia Hy-Court Mesh PVC which are available within INR 2000. They are made up of high quality PVC synthetic leather. The shoes are ergonomically designed to give maximum support and stability to players. They are available on top online stores. You can choose any colour and size according to their preferences on this sites. Sole material is Eva(middle sole) and Rubber, cushioning is done with mesh PVC. This shoe have a standard quality make in this price range. Available for all foot size from 3 to 12 (UK) size. Another option within INR 2000 bracket is ProAse Men’s Yellow shoes. They have a non-marking sole and are made up of Synthetic leather. Made with synthetic leather and non marking sole (good grip). Available in sporty yellow black combination. This is also a good choice for beginner and intermediate players. or men, Yonex SRCI 65 R are the best pair of shoes coming under the INR 3000. They are made up of fine quality leather and Polyster Mesh. Another good brand of shoes which come under the range of INR 3000 are the Ali – Ning Star Icon shoes. The striped pattern makes them look elegant. Different materials are used for making the outer and inner part of the shoes. The outer material is made up of artificial leather, PU and mesh whereas the inner material is synthetic. If you have got more budget then you go for Yonex SHB 46EX Badminton shoes which come between the range of INR 4000 to 5000. Features includes Yonex power cushion, PU-leather, polyester mesh. Available in different size options. If you want to get some attention to your shoes then you can choose Li-Ning Star Trek. These shoes got a glossy look which makes them look more beautiful. Price of the shoes are between INR 3000 to 4000.
nother pair of shoes from the Yonex brand is Yonex SHB 34jrex. They are good for intermediate matches. Comes with best features of Yonex shoes for badminton. These are probably the best pair of shoes which are under the INR 10000 price bracket.